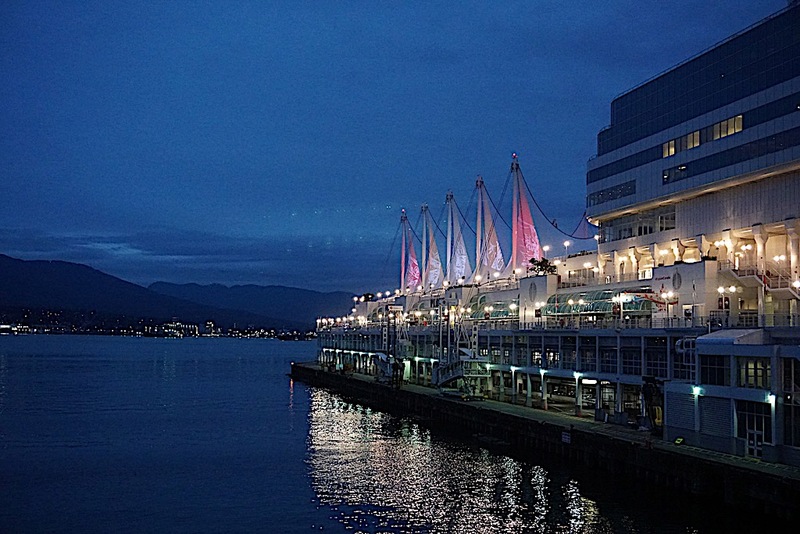 Vancouver is a growing popular tourist attraction and one of the best places to live. I love that it is equal parts urban and equal parts nature making it easy to experience city life and outdoor adventures. We chose to go here on a family vacation because we heard that there is so much to do for all ages. It was a nice escape from the heat of Southern California and I love that it was only a short 3 hour flight too from Orange County (perfect for the kids). We did a lot of sightseeing while we were there, so I put together our favorite tourist spots that both the kids and adults enjoyed. I personally didn’t go to Science World, but my hubby took the kids himself. While he is a great man for taking three kids to a museum all by himself, it was a perfect place for them to almost watch themselves with all the interesting exhibits they have going on. I met up with the family at the museum afterwards and the kids were all so excited to tell me about the fascinating things they had learned and seen. Their favorite exhibits included a human mouse wheel where they had to run to produce watts to make it move, the hands-on exhibit where they built a bobsled and raced them, and the older kids really liked the virtual reality experience where they went on an intense canoe ride down what they called a “frightening” river. There are so many incredible hands-on exhibits and more to see that the kids were there for over two hours and still didn’t want to leave. 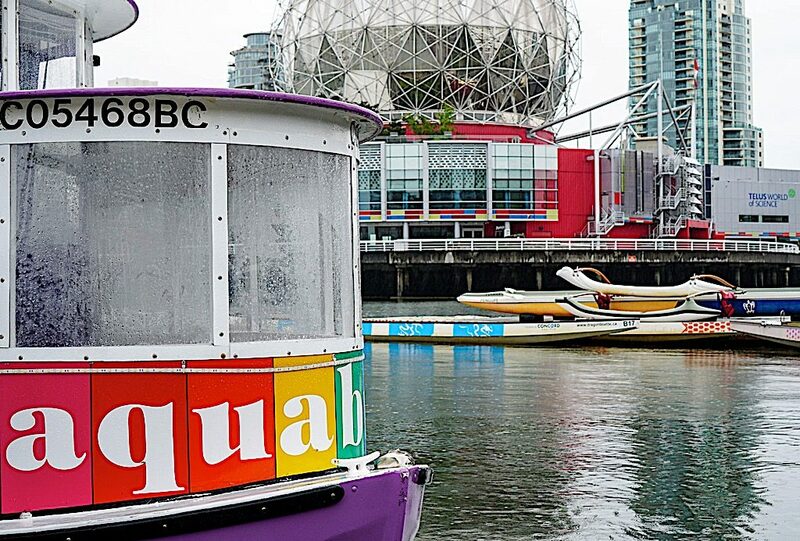 After our visit to Science World, we went to Granville Island via the Aqua Bus (which I highly recommend) since it was walking distance from the Science World at Telus World. 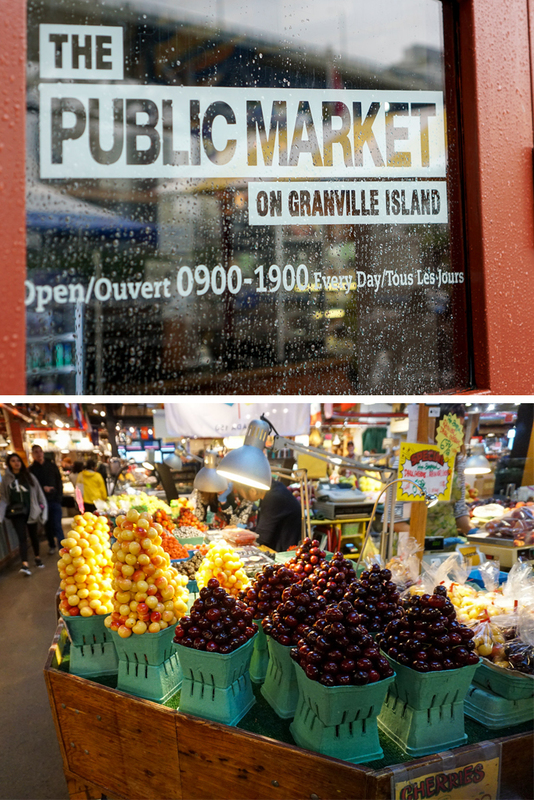 I am a self-professed foodie and was excited to go to the Granville Island Public Market which is the jewel in the Island’s crown. It was raining all day so it was a great time to visit the indoor market that features local food, produce, handcrafted products and gifts. 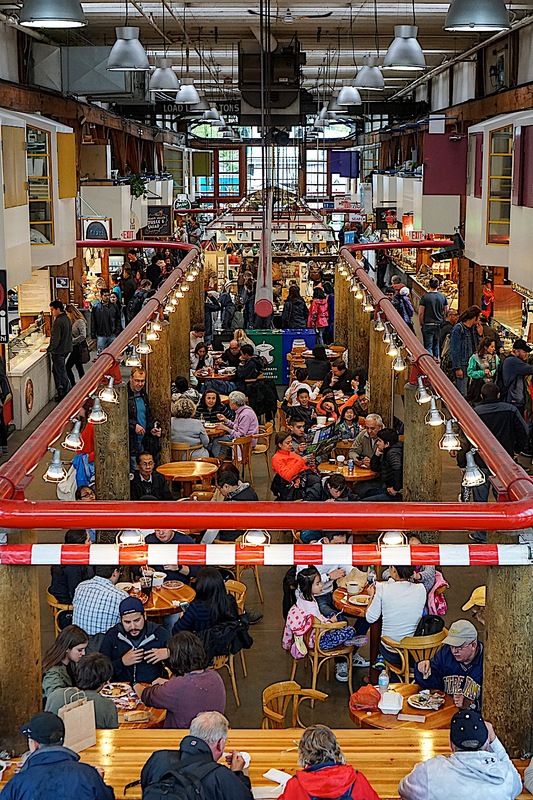 After we got our fill of fresh fish and incredible lemon bars at the Public Market, we walked a few blocks to the Kids Market which is a fun shopping experience for kids. There are over 25 shops in this two story building that sells educational toys, costumes, clothes, and so much more. There is even a ball pit and old fashioned arcade inside. One of our favorite stores was the Panda Store that sold literally anything and everything with a panda on it (even Panda fidget spinners)! See fare options for individual routes here. What’s so amazing about Vancouver is that you can be in the city one minute and in about fifteen minutes you can be surrounded by nature and in the wild. Taking a free shuttle from Canada Place (you just need a paid admission for Grouse Mountain), we went up to Grouse Mountain on the Super Skyride. It was too cold to ride up on top of the Skyride so we stayed indoors where the Guide took us up on a short informative tour to Grouse Mountain. Since it was almost summer and we are from Southern California, we didn’t expect the cold temps up at Grouse Mountain and came a little underdressed. 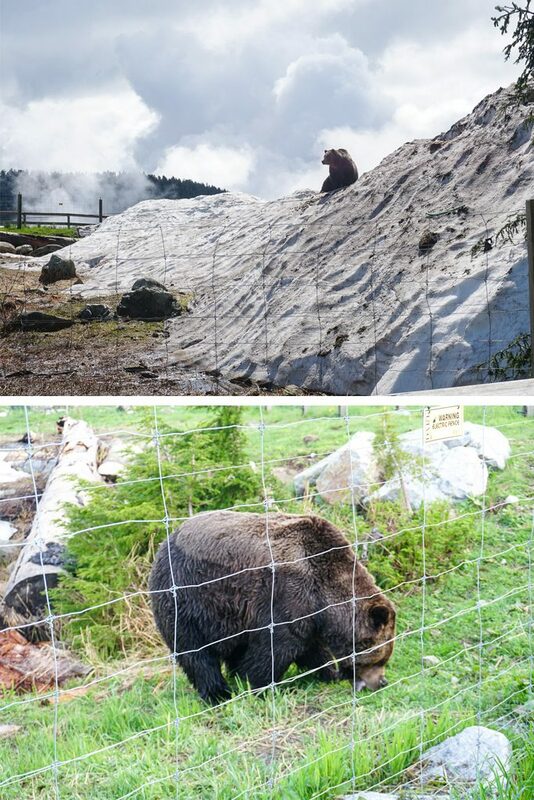 While freezing our buns off, we saw Grouse’s very own grizzly bears, Grinder and Coola, the Birds in Motion demonstration, and the Owl Interpretive Session. Our favorite show, however, was the world famous Lumberjack Show with Johnny Nelson and Willie McGee where they compete against each other to determine who is the best lumberjack. Filled with puns and adult humor that even the kids laugh at, this was a show you don’t want to miss. 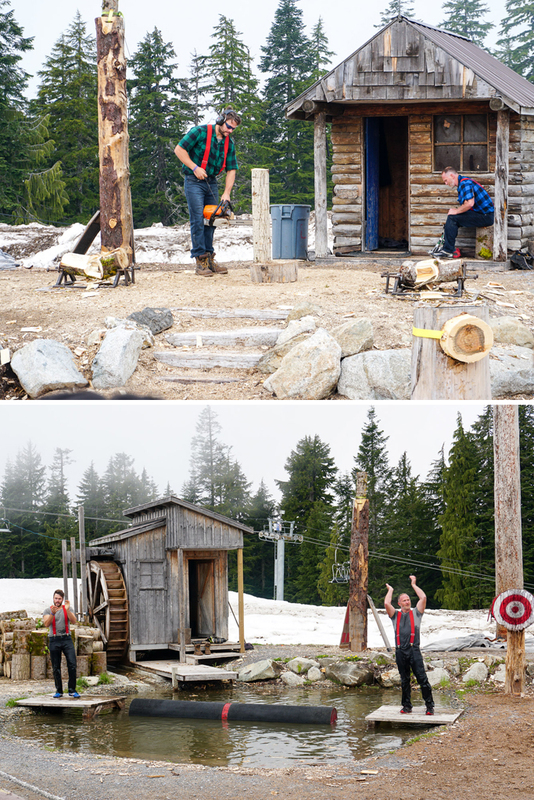 There are so many more activities to see and do at Grouse Mountain such as Helicopter Tours, Mountain Ziplines, Tandem Paragliding and more, but none of which we were dressed for or brave enough for on this trip. 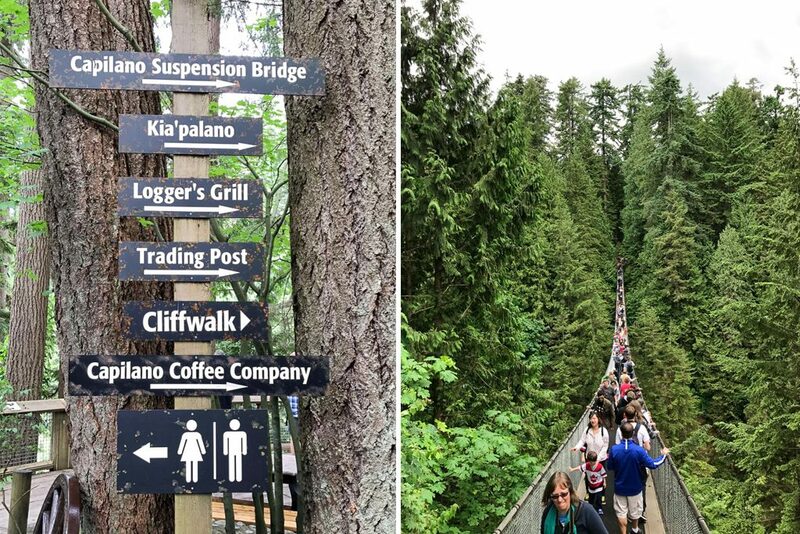 Heading down from Grouse Mountain is the infamous Capilano Suspension Bridge. Much warmer than Grouse Mountain, we made our way across the 450 foot span that is 230 feet high and a little bit scary (a lot scary for my husband and son who are afraid of heights and skipped out on this adventure). Once we crossed this busy and shaky bridge, we also did Treetops Adventure which is a series of smaller suspension bridges (some reaching as high as 80 feet above the forest) to see a squirrel’s eye view of the coastal forest. While my son was too scared to do the Capilano Suspension Bridge, he found the Cliffwalk manageable which is to the right of the Bridge. 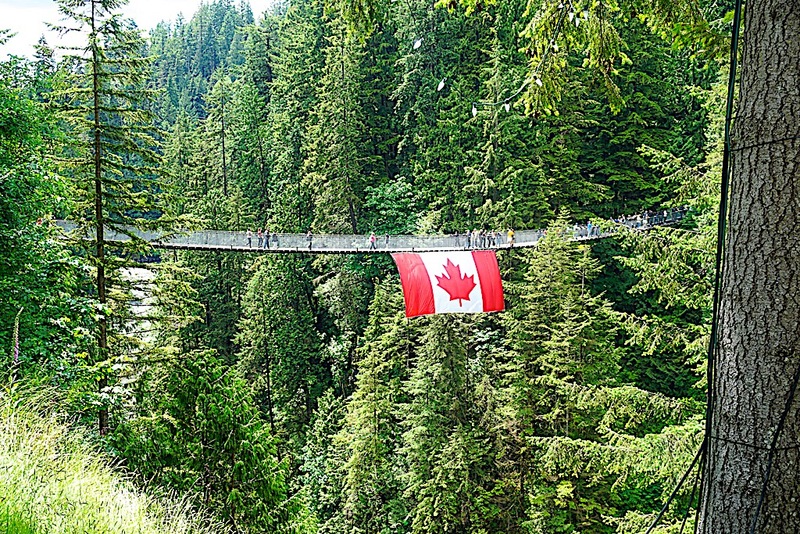 I personally thought the Cliffwalk was more frightening than the Bridge itself because it is so much more narrow, but I was able to muster enough courage to go out on the granite cliff face which juts out high above the Capilano River Canyon below. If you go to Vancouver in the winter, Canyon Lights is an amazing festival that you can attend at night to see all the holiday lights on the bridge (during November 23, 2017 to January 28, 2018). If you have every been to California Adventure’s Soaring Over California, this virtual fight ride is very similar. 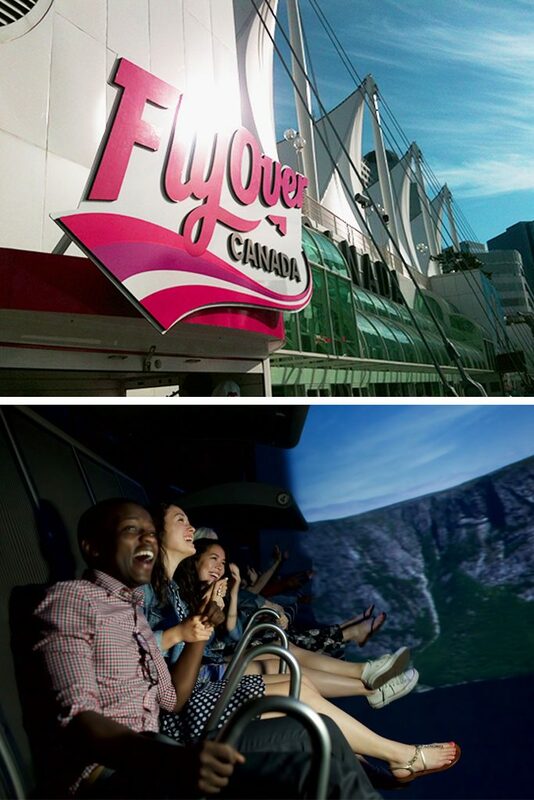 FlyOver Canada is one ride you don’t want to skip! 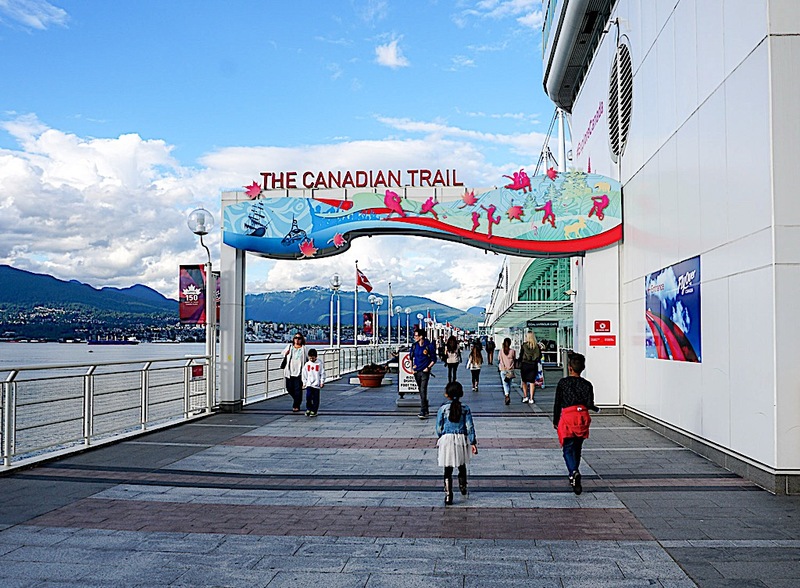 Located east of Canada Place’s iconic five sails with cruise ships anchored in front, FlyOver Canada will have you soaring over mountain tops, breathing in pine forests and feeling the mists from the waterfalls. This ride is just an incredible way to see all of Canada’s landscapes from above and something we really enjoyed. Children must be at least 40” (102 cm) to ride. If you purchase tickets online, you immediately save 15% (off rates below). 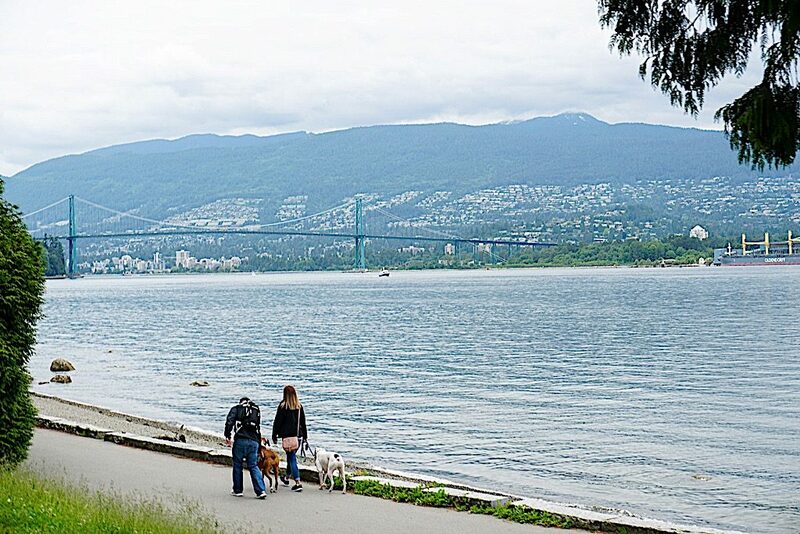 Stanley Park is one of Vancouver British Columbia’s main tourist destinations and is over 1,000 acres of beautiful beaches, sports fields, gardens, Seawall, cedar, fir, and hemlock trees. 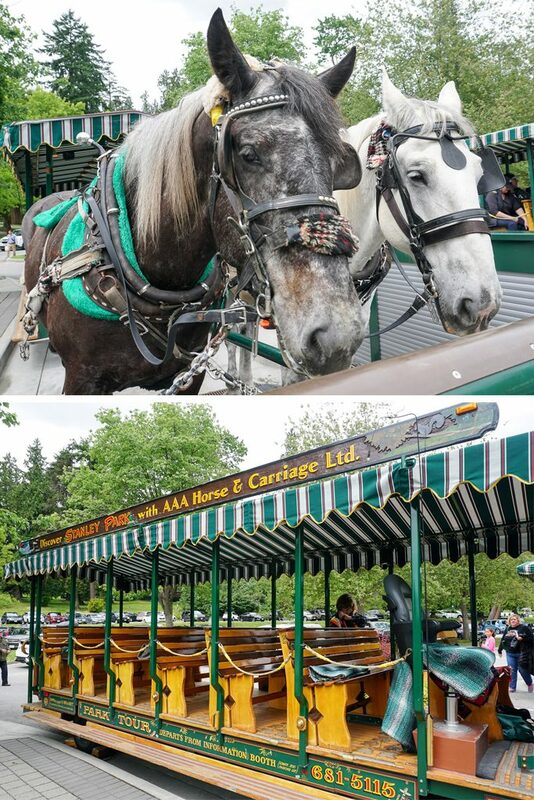 One of the best ways to see this amazing park is on the Stanley Park Horse-Drawn Tours. This is a one hour exploration with friendly guides who really know the history of Stanley Park and Vancouver (you even get to stop off and see the First Nations totem poles). We were a little disappointed to see that it was more like a horse-drawn trolley than a carriage (I was expecting something like New York’s Central Park carriages), but it the end it didn’t matter and was still worth the $42/adults and $20/ children price just to see parts of Stanley Park we probably wouldn’t have seen otherwise and to hear the narration from the guides. No reservations required, for more information on seasonal hours and rates, click here. The Vancouver Aquarium is Canada’s largest aquariums and is located at Stanley Park. 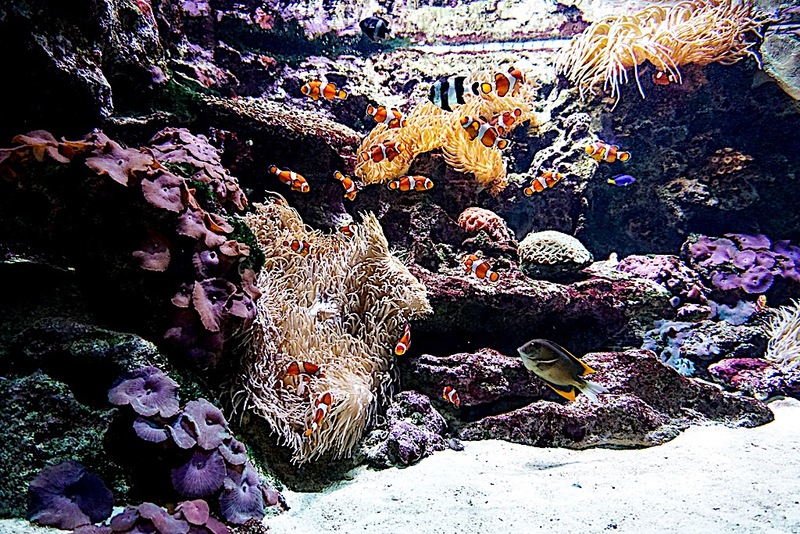 The Aquarium is home to over 70,000 fascinating creatures from the Arctic to the Amazon. 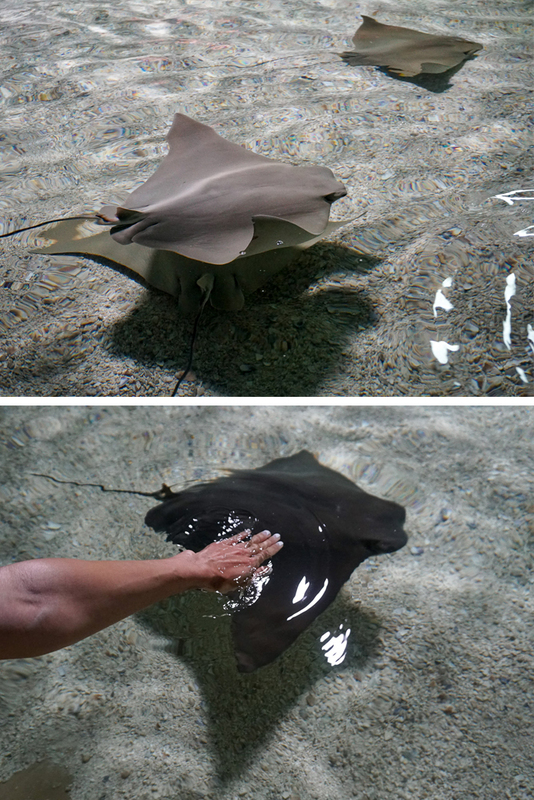 We saw penguins, sea otters, dolphins, whales, octopus, and all kids of jellyfish (my personal favorite) and was even able to do a hands-on animal encounter with stingrays! 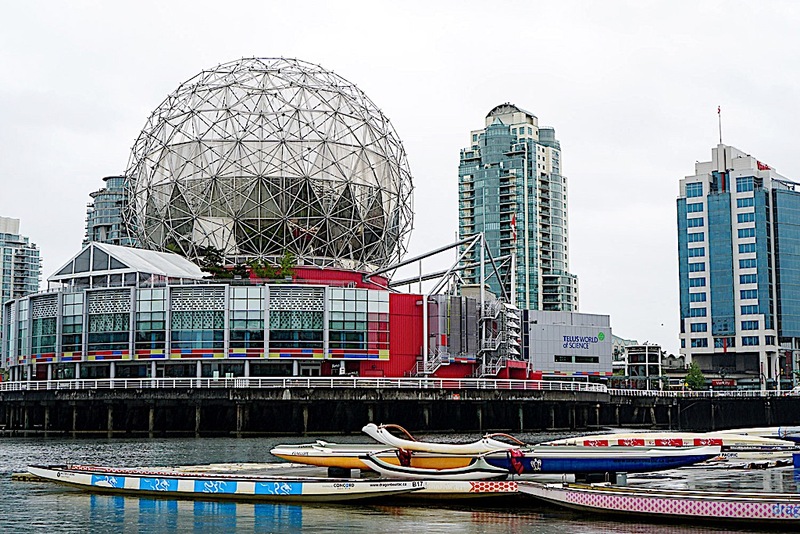 These are some of the major tourist attractions in Vancouver that we really enjoyed as a family and highly recommend if you are in the area. We did these adventures in the span of three days but also took our time. For more information on these must-see locations, click on the links above each sight. Thank you to Tourism Vancouver for sponsoring this post. We had an unbelievable time in Vancouver and can’t wait to go back! Vancouver looks amazing!! I haven’t been there myself, but judging from your photos, it reminds me of Melbourne. It’s a city has a nice city vibes, great water front views, and lots of outdoor activities to do. I can’t wait to visit the city early next year before I head over to the mountains in Whistler for ski. I definitely want to check out that suspension bridge! It looks so stunning!!! Canada and Vancouver in particular have for a long time been on my top list of travel destinations and this post sparked that interest even more. There seems to be so much to do whatever you’re into and although I’m a bit of a daredevil I must say that bridge looked really scary, haha, as I’m SO afraid of heights. I also would skip the other rather adventurous things you suggested, but would stick to admiring the beauty of nature and the culture in the city. Really looking forward to visit Vancouver now! It looks like you had a great family vacation! 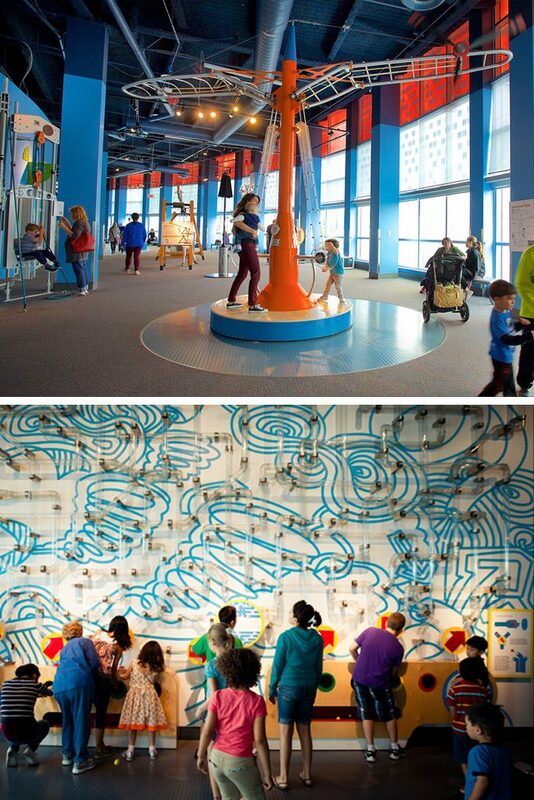 There’s a science and math museum here in NYC and I went there recently with my niece but I don’t blame you for skipping it haha. I am all about the markets when I travel so I’m glad you were able to experience that. 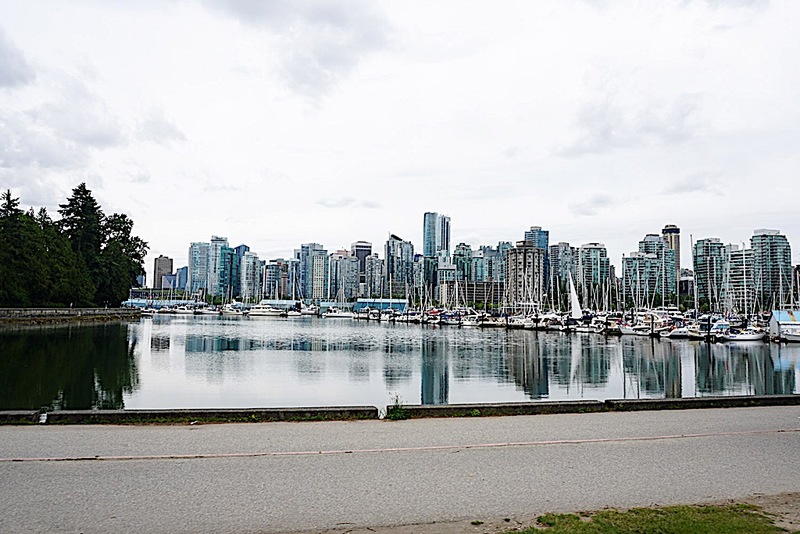 Vancouver is definitely a beautiful city and a great getaway that I want to take soon! There are so many incredible things to see in Vancouver! I want to visit that public market and the aquarium, but ahhh no thanks to that suspension bridge – especially crowded with so many people. I’d be freaking out haha! It looks like you had an awesome trip though! I’ve only been to Vancouver once, but went into the city for a day and was in Whistler the majority of the time! It’s such a gorgeous city and I’ve been saying for ages that I wanted to go back! When I do, I’ll definitely be heading back to this post to read up on what I should do! Wow I didn’t realize that there were so many cool things to do in Vancouver! I’m loving all of these outdoor/nature activities. 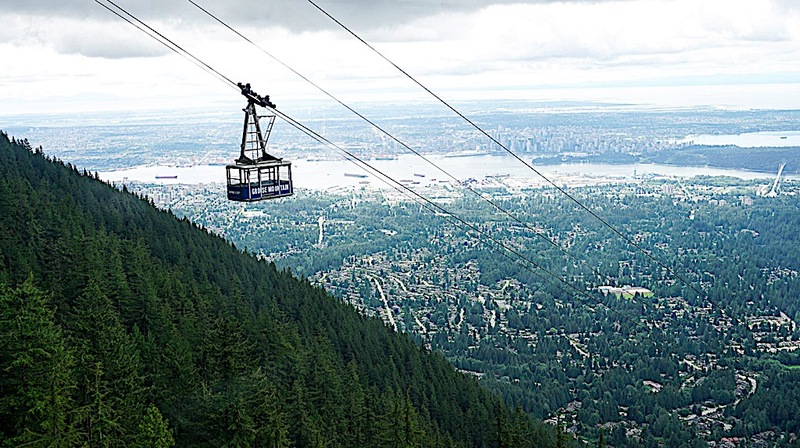 Grouse Mountain and The Capilano Suspension Bridge especially look like really awesome experiences. Will be in Vancouver this August — thanks for the tips and sharing thus information. Do you think it’s ok to go to suspension bridge with 2- 2 year old ? Vancouver looks amazing and the photos are so full of life and beautiful What a fun time for your family! Vancouver looks so inviting to get out and enjoy nature. Beautiful city. Aww, man I love Vancouver! Now I definitely want to go back there, and I missed so many of these things to see! need to go to Grouse Mountain and Fly Over Canada! Great post girlie, I’m so excited! I’ve only heard how amazing Vancouver is, but I have never seen it like this in pics! I can see why you and your family had such an amazing time. Science World is definitely a place my stepson would love to go since he loves science so much! Oh my, I’ve always wanted to visit Vancouver, I think it’s such a wonderful place and I believe, it has a lot to offer. The Grouse Mountain is literally a must-visit spot there, am I right? Such a beautiful view… Unbelievable! Thanks for sharing all your great adventures with us! This place is definitely on my bucket list, haha! Vancouver looks great! I’ve never considered traveling there before. I wish you would have gotten that one lumberjack’s phone number for me 🙂 Oooo la la! Vancouver has been on my wishlist for a while now! You are so lucky it is only a short plain ride away from you. Looks like you and your family had the best time! I would have loved to go to grouse mountain! Must have been such a beautiful experience! Canada is still on my list to cross off and my partner has spent a whole year living over there and has nothing but great things to say about it! Love how it’s so easy for you to access these places because everywhere is far from Australia! Love how your hubby gave you some time off and took the kids to science world! Such beautiful photos! 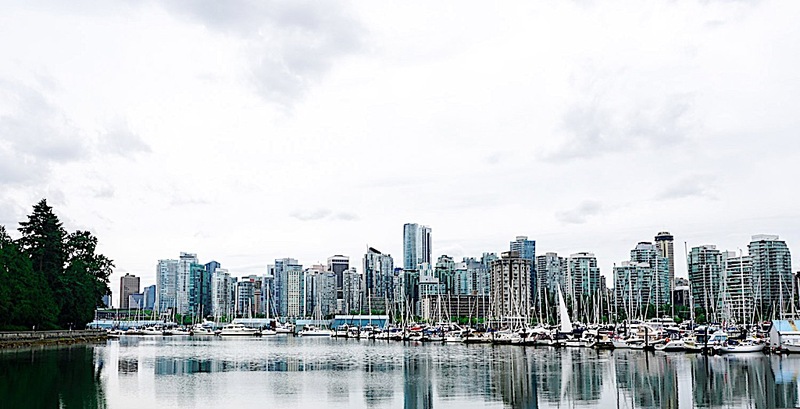 Vancouver looks so lovely — its on my list! I always read your blog when I know I will have interrupted time because I always am so fascinated and have to click every link and write down stuff to remember. This time I will simply copy and paste the link and send it to my husband because Vancouver is definitely the place for us. I can totally picture us at the Science museum, trying the adult mouse wheel and I know my daughter especially would love the Children’s Market and the Panda themed store. I’m surprised at the fact you can experience the city life and see such scenic spots so closely. Overall there is so much to see and do I can’t really imagine a better family vacation! Thank you so much! You had me with that gorgeous skyline! I need to see Vancouver… stat! So many amazing things to see and do! Wow! I’d love to visit Grouse Mountain and the Calipano Suspension Bridge! My sister lives in Ontario so I’d love to visit across Canada someday and see these sights! What a fun trip! 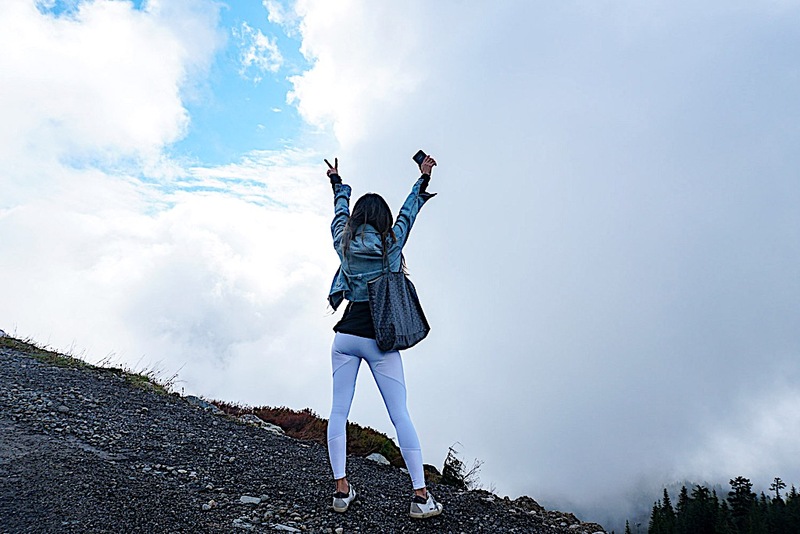 I love how kid friendly your adventures are – I should totally steal your itinerary and schedule a family trip to Vancouver! 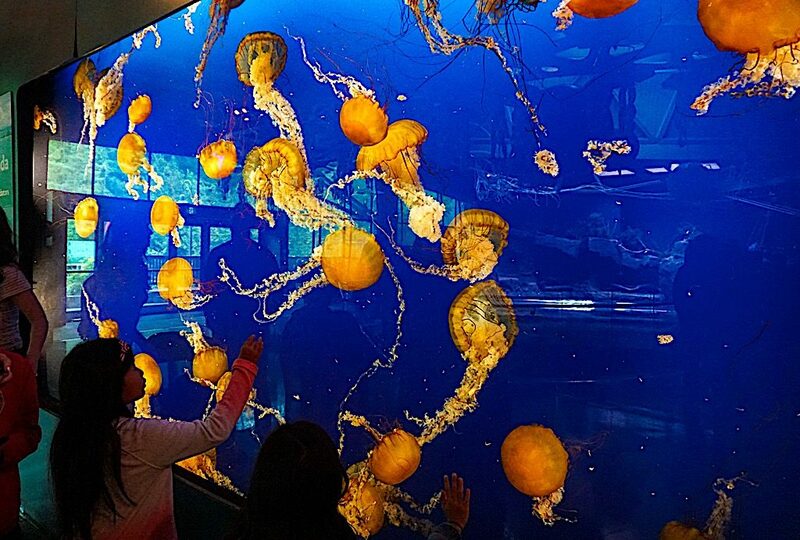 My kids would love Science World and the Aquarium! And the Super Skyride looks like so much fun! This sounds like such a fun trip and it’s so nice that you got to get away with the family. I’ve been wanting to make a trip to Vancouver or Canada for that matter. The suspension bridges and aquarium sound so fun! Thanks for a full guide on this. I’ll have to keep all this in mind when I eventually do visit. 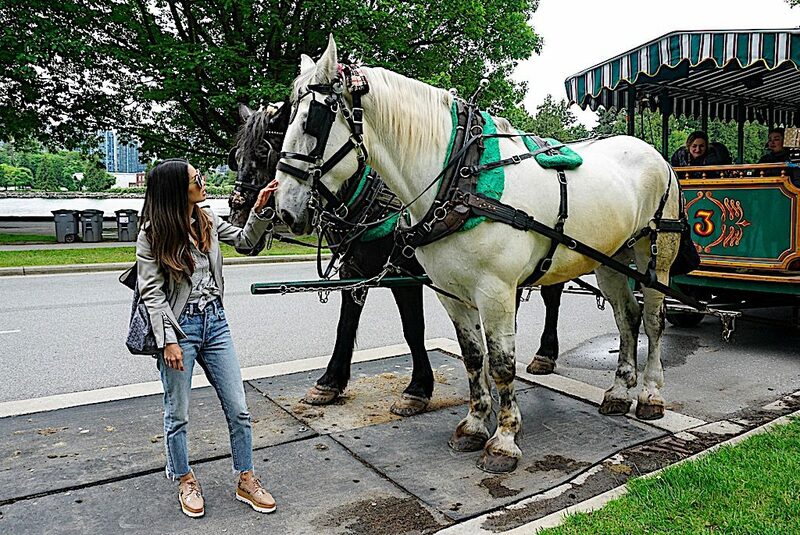 Great post, thanks for sharing 🙂 I would love to visit Vancouver! Wow this is a packed three day trip you had with your family in Vancouver. Every tourist attraction seems so amazing and worth every penny/second! I’m especially interested in the FlyOver Canada, I love virtual rides/flights like that because for some reason I feel safer than flying in a real helicopter haha, and yet still get to experience the scenes. I love that you took the kids to the kid market too, so they get rewarded after following mommy through the public market. I’d love to also visit the suspension bridge and the aquarium. Actually, I take that back, I want to go to everything!!! OK I’m sold I want to go to Vancouver. I don’t have kids but I’m a big kid at heart and I love checking out aquariums and museums and that mouse wheel sounds like so much fun. Thanks for making this amazing list of places to check out I’ll be bookmarking that for when I travel over there. 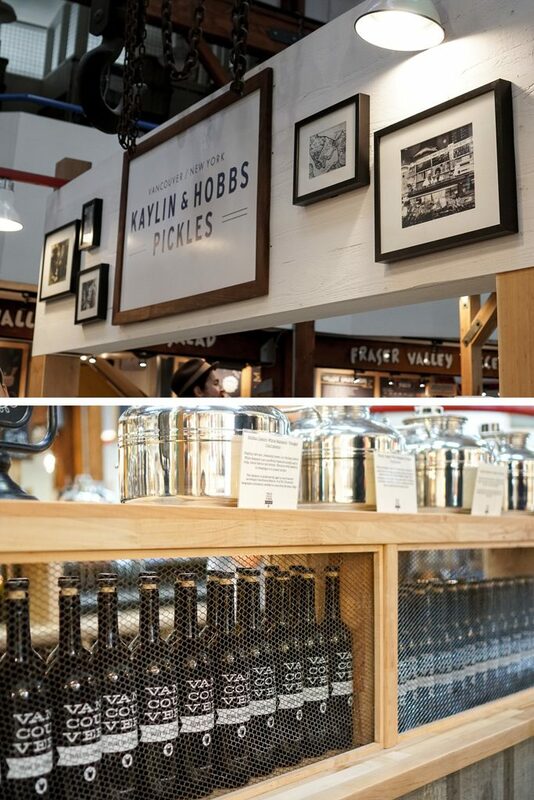 Such a great Vancouver guide! Thanks for all the tipps and wonderful pics! There are so many amazing places in Vancouver. Thank you for sharing them with us! I would love to visit it one day. Would like to go to the Granville Island, Capilano Suspension Bridge (breathtaking experience) and Capilano FlyOver Canada. Amazing and fun activities! Woww!! Such an amazing pictures!! I would like to be there! Goodness, so inviting.Must sees indeed.I love the pictures.The places look like so much fun. AH I miss Canada so much! Looks like you had an amazing time and you got to do so much more than I did. Def can’t wait to go back! This is an amazing post! I have never been in Vancouver but I loved to know a little bit about this wonderful city and its views and activities through your lens! Your images are so pretty and very well taken.It looks like you had an incredible vacation. Thanks for sharing your adventure in Vancouver! Now, It will be one of my top ten travel destinations! I would love to take my kids to the aquarium and the bridge looks scary but I would love to try it, haha! What a wonderful in-depth guide to Vancouver! I’ve never been these but after reading this guide I feel like I must! The science museum looks so fun- I love all sorts of geeky entertainments! The bridge looks a bit scary though – I kind of afraid of the hights. What do uoI believe is the best season to visit Vancouver? I loved all of these photos, everything looks so exciting! I never been in Vancouver, but my husband used to go there all the time. I hope next year we can finally travel there. It looks like you did a lot of activities. I bet it is very hot in SoCal. It is so fun to see you have been traveling a lot lately. I have never visited, but it looks and sounds amazing. I would love to visit, hopefully soon. Vancouver is on my list of places to travel to!! I am definitely bookmarking this to make sure that I visit some of these places hehe. I definitely want to check out the Sky ride! It looks so beautiful and serene. Also the suspension bridge sounds a bit adrenaline seeking to me but I’d love to experience that as well. It’s crazy how many people were on the bridge at the time you took your selfie hah! Glad you enjoyed your trip!! I always love your travel posts! I remember seeing all of your beautiful photos on Instagram! I have never been to Canada, but lately it has been moving up on my list of “Places to Travel.” I love that the city and nature are so close together. Perfect for me and my boyfriend. I am a city girl and he LOVES the nature. Thank you for sharing these must sees! Grouse Mountain looked so beautiful, and although you were cold, you still looked cute! I love the white leggings! 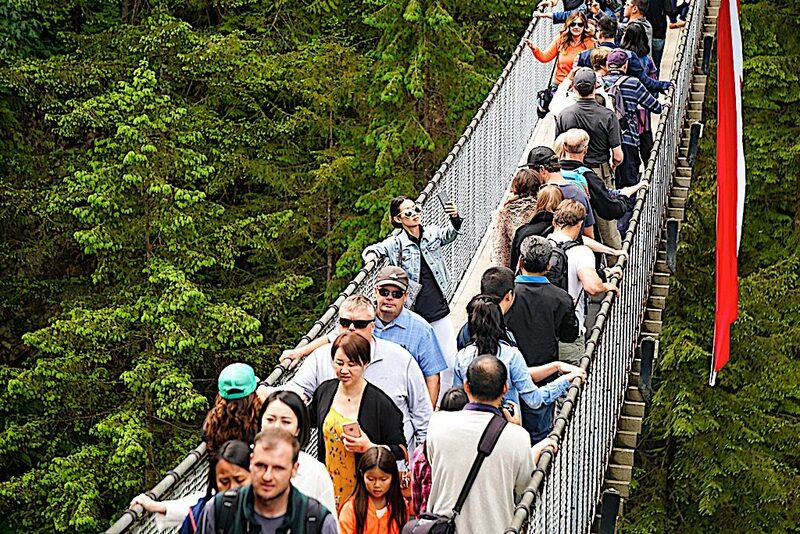 Capilano Suspension Bridge looks so intense! I am not afraid of heights, but I would be so scared that the bridge would break with all of those people! I love the picture of you taking a selfie on the bridge 🙂 Can’t wait to read the next one! Oh Tandya, you would love it here in Vancouver then! It’s such a close flight and your really get the best of both works – nature and city AND great food! There is a lot to do but can be covered in a few days and Canadians are some of the friendliest people! Definitely go asap! Also, never been in Vancouver before and it seems like it has a lot to offer! Love your recommendations! So much detail girl, really the perfect travel guide post! Call me crazy but that suspension bridge is calling my name out of all of this! hahahaha so much fun!! You got me missing Canada so much, what a great post. Seem like a fun trip, thanks for sharing love. What a beautiful post! Loved all the pictures of this beautiful city and seeing all the neat things to do there! Thank you!